Zucchini, recently all the rage when spiralized into noodles... or should we say, zoodles! But, we're not complaining! Zucchini is filled with minerals and nutrients, such as vitamin C, vitamin A, potassium, omega-3 & omega-6 fatty acids, manganese, and other phytonutrients - lutein and zeaxanthin. Specifically, the manganese found in zucchini is a strong antioxidant that increases levels of the detox enzyme, superoxide dismutase. It's also essential for healthy skin and metabolizing protein. Little zucchinis, we think you're the bomb dot com! combats oxidative stress from free radicals, provides eye, skin, anti-cancer, antimicrobial, cardiovascular & anti-inflammatory benefits, supports blood sugar regulation, and may help lower blood pressure. When eating zucchini don’t forget to each the skin in order to get all the antioxidant benefits! Also, did you know the zucchini plant has edible flowers?!? Tomatoes, a go-to for beauty advocates everywhere! These red, delicious beauties are rich in many vitamins and minerals, but the star player is its pigment antioxidant, lycopene. Like Ruby Red grapefruit, tomatoes are also rich in this special carotenoid that provides great beautifying and detoxifying benefits. It’s no wonder why dermatological companies are using natural tomato and grapefruit extracts as key ingredients in their face wash and lotions. But it’s not just about clearing and rejuvenating your skin, lycopene also works as an internal sunscreen, providing even more powerful skin benefits than you ever thought possible. Specifically, lycopene helps combat free radicals created by the sun’s UVA and UVB rays. More specifically, cooked tomatoes (like tomato paste) may actually contain “more accessible” lycopene than raw tomatoes. One study in J. Agric. Food Chem. (2003) found that when raw tomatoes are cooked the vitamin C content decreases, but the total phenolics and antioxidant capacity actually increased. Another J. Agric. Food Chem. study (2002) found that although vitamin C is lost, the antioxidant activity of the tomato remains due to the cooking process actually elevating the total antioxidant activity and bioaccessibility of lycopene content. Concluding that the thermal processing actually enhances the nutritional value of the tomatoes. And let’s not forget, roasted tomatoes are also rich in vitamin C, A & E, all of which provide even more beautifying skin (and eye) benefits. So, enjoy the benefits of the skin enhancing tomato and feel beautiful from the inside out! Up until 1820, North Americans thought tomatoes were poisonous; however, that summer they were proven safe to eat. Everyone desires clear, beautiful skin; there’s no doubt about it. 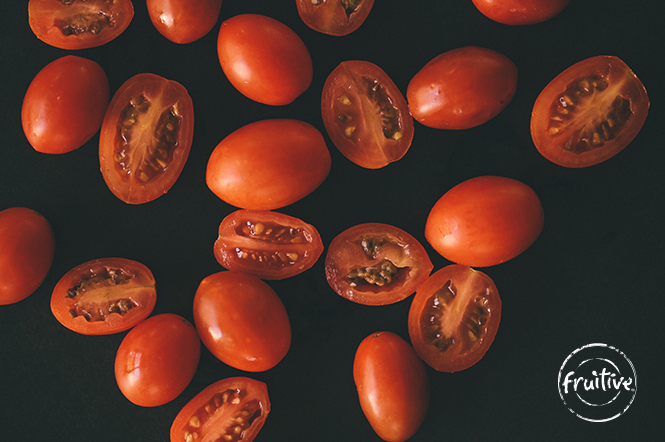 So, read on people, because tomatoes might be just what you need. These red, delicious fruits are rich in many vitamins and minerals, but the star player is its pigment antioxidant, lycopene. Like the Ruby Red grapefruit, tomatoes are also rich in this special carotenoid that provides great beautifying and detoxifying benefits. It’s no wonder why dermatological companies are using natural tomato and grapefruit extracts as key ingredients in their face wash and lotions. But it’s not just about clearing and rejuvenating your skin, lycopene also works as an internal sunscreen, providing even more powerful skin benefits than you ever thought possible. Specifically, lycopene helps combat free radicals created by the sun’s UVA and UVB rays. Not to mention, tomatoes are also rich in vitamin C, A and E, all of which provide even more beautifying skin (and eye) benefits. So, enjoy the benefits of the skin enhancing tomato and feel beautiful from the inside out! Tomatoes, a go-to for beauty advocates everywhere! These red, delicious beauties are rich in many vitamins and minerals, but the star player is its pigment antioxidant, lycopene. Like Ruby Red grapefruit, tomatoes are also rich in this special carotenoid that provides great beautifying and detoxifying benefits. It’s no wonder why dermatological companies are using natural tomato and grapefruit extracts as key ingredients in their face wash and lotions. But it’s not just about clearing and rejuvenating your skin, lycopene also works as an internal sunscreen, providing even more powerful skin benefits than you ever thought possible. Specifically, lycopene helps combat free radicals created by the sun’s UVA and UVB rays. More specifically, fire-roasted tomatoes may actually contain “more accessible” lycopene than raw tomatoes. One study in J. Agric. Food Chem. (2003) found that when raw tomatoes are cooked the vitamin C content decreases, but the total phenolics and antioxidant capacity actually increased. Another J. Agric. Food Chem. study (2002) found that although vitamin C is lost, the antioxidant activity of the tomato remains due to the cooking process actually elevating the total antioxidant activity and bioaccessibility of lycopene content. Concluding that the thermal processing actually enhances the nutritional value of the tomatoes. And let’s not forget, roasted tomatoes are also rich in vitamin C, A & E, all of which provide even more beautifying skin (and eye) benefits. So, enjoy the benefits of the skin enhancing tomato and feel beautiful from the inside out! Olives, the makers of olive oil, are high in healthy monounsaturated fats (like omega-9 & 3) and phytonutrient antioxidants. Olive’s fatty acid content is great for proper balance of total cholesterol and lowering blood pressure, while its phytonutrient content (phenols, terpenes, flavones, hydroxycinnamic acids, anthocyanidins, flavonols, flavonoid, glycosides, lignans, and hydroxybenzoic acids) brings along anti-inflammatory, immune boosting, & anti-aging properties. But that’s not all, olive oil is also packed with other great antioxidants, including, but not limited to, vitamin E and beta-carotene - making them great “beautifying” foods as these nutrients contribute to healthy skin & eyes! promotes heart, skin, bone, cognitive, anti-cancer, & anti-inflammatory benefits. may help balance total cholesterol & lower blood pressure. All olives actually start green – as they ripen they changes colors to black or dark purple. Cucumbers, or cukes as we call them, provide many health benefits; including being energizing and hydrating, while also having anti-inflammatory and cancer fighting properties. But one health benefit seems to stray from the rest – cucumbers may actually be the answer to your next hangover! This water-rich, cleansing vegetable not only helps hydrate and flush out toxins from your body, but it's also loaded with essential vitamins and minerals that you may be lacking after a long night out on the town! So after a night of fun, load up on cucumbers as your midnight snack and wake up feeling replenished and ready for the day ahead. Vitamin K, molybdenum, vitamin C, potassium, manganese, magnesium, tryptophan, vitamin A, phosphorus, pantothenic acid, flavonoids, lignans, and triterpenes. Cucumber’s are 96% water; thus, the skin and seeds provide much of the cucumber flavor. Also known around the world as "maize" from the Spanish word, "maiz," corn has been a staple in many diets for centuries (actually, corn was first domesticated in Mesoamerica, more than 8,000 years ago). We specifically love corn because of its special benefits in combination with legumes, like black beans. This combination may enhance our zinc, calcium, and iron absorption, as well as, increase our energy and protein intake. Great stuff, right?!? That’s why our Southwest Romaine Wrap, Southwest Salad, and Southwest Steamer are all made with our house-made corn & bean salad - plus it’s delicious! promotes good digestion & blood sugar regulation, & when combined with legumes, like black beans, may enhance zinc, calcium, and iron absorption as well as energy and protein uptake. There are over 100 subspecies of corn – they come in all different colors depending on their different concentrations of phytonutrients. Butternut squash sure give carrots a run for their money - as it’s one of the richest sources of vitamin A and beta-carotene around! Plus, as you probably know, butternut squash provides a delicious, sweet, yet nutty, flavor, but did you know it’s filled with antioxidants and immune boosting nutrients, which subsequently makes this squash perfect for the fall and winter months?!? You can actually eat butternut squash seeds similar to pumpkin seeds – great roasted & salted!